Put on your party shoes and get ready to kick up your heels at the big dance. 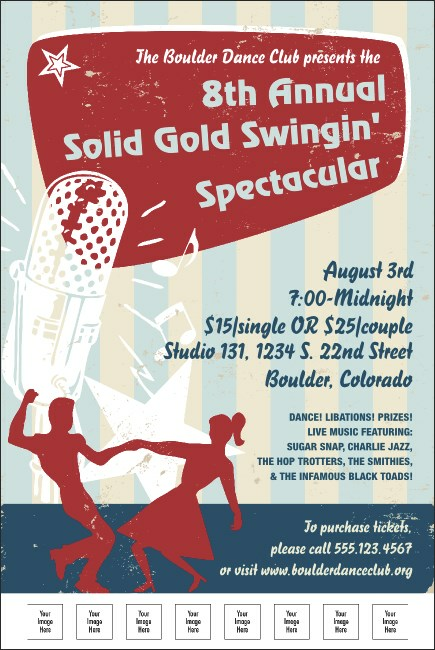 If you know where it's at, let the rest of us in on it with a big Solid Gold Swingin' Spectacular! With spotlights on a colored stage, a retro microphone and swing dancers, this poster template also lets you upload eight of your own custom images to showcase bands, sponsors, or anyone else whose picture you want on your publicity material. No matter what the occasion or the size, you'll find the right Event Kit at TicketPrinting.com.